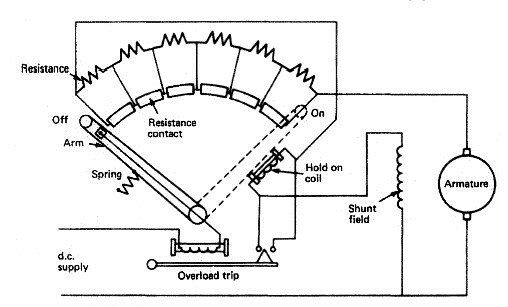 In this article we are studied about how to starting a dc motor, two and three point starter. To start dc machine, the torque developed by the motor at zero speed must exceed that required by the load. Then (motor torque) and load torque will be positive so dw/dt is also positive and the machine accelerates. The induced EMF at starting point is zero as the speed of the motor is zero. The armature resistance of dc machine is such as t cause 1 to 5 percent drop at full load current. Hence, the starting current tends to rise to several times the full load current. The machine instantly picks up the speed. As the speed increases the induced EMF appears across the terminals opposing the applied voltage. The current drawn from the mains thus decreases and hence the torque. This continues till the load torque and the motor torque are equal to each other. Machine tends to run continuously at this speed as the acceleration is zero at this point of operation. Various types of manual starters for dc motors, commonly known as two-point, three-point, and four-point starters are available. A degree of similarity exists among these starters. All have a face plate rotator switch with a connected group of current limiting resistors. The difference lie in the form of protection they contain. A two-point starter is used for starting dc motor which has the problem of over-speeding due to loss of lod from its shaft. Such a starter is shown in figger. Here for starting the motor, the control arm is moved clockwise from its OFF position to the ON position against the spring tension. The control arm is held in the ON position by an electromagnet. The hold-on electromagnet is connected in series with the armature circuit. If the motor losses its load, current decreases and hence the strength of the electromagnet also decreases. The control arm returns to the OFF position due to spring tension, this preventing the motor from overspending. The starter arm also returns to the OFF-position when the supply voltage decreases appreciably. L and F are two points of the starter which are connected with the supply and motor terminals. A thre-point starter is used for starting a dc shunt or compound motor. The coil of the hold-on electromagnet is connected is series with the shunt-field coil. Such a starter is shown in figger. In case of disconnection in the field circuit due to internal failure or field-rheostat failure, the control arm will return to its OFF position due to spring tension. This is necessary because the shunt motor will over speed in the same manner as the series motor if it loses its fild excitation. The starter also returns to the OFF position in case of low supply voltage or complete failure of supply voltage. This protection is therefore called No volt release (NVR). Over-load protection for the motor can be incorporated by connecting another electromagnetic coil in series with the armature. When the motor is overloaded it draws a heavy current. This heavy current also flows through the electromagnet coil. The electromagnet then pulls an iron piece up words which short-circuits the coils of the hold-on electromagnet (NV coil,). The hold-on electromagnet gets de-energized and therefore the starter arm returns to the OFF postion,thus ,protecting the motor against overload. The complete circuit connection for a three-point starter with NVR and over load realsease (OLR) is shown in figger. It is to be noted that points L,A,and F are the three terminals of a three-point starter. Use of a brass arc, as shown in the figure,enables connection of the field circuit directly eith the supply instead of via the starter resistance. A three-point starter may not be suitable where a large field current adjustment by using a field regulator is needed. This may cause weakening of the field current to such an extent that th hold-on electromagnet may not be able to keep the starter arm in the ON position. This may therefore disconnect the motor from the supply when it is not desired. Such a problem is overcome by using a four-point starter.